The original Macintosh computer Steve Jobs introduced in 1984 might never have achieved such iconic status without the help of the desktop publishing revolution. Together with the first LaserWriter printer and software like PageMaker, the Mac made it easy for anyone to lay out newsletters, brochures, or even entire magazines. More than three decades later, the term “desktop publishing” isn’t used all that much now that the focus has turned to web, social media, and mobile—but developers haven’t turned their backs on the original concept, which is easier and less expensive today than it used to be. 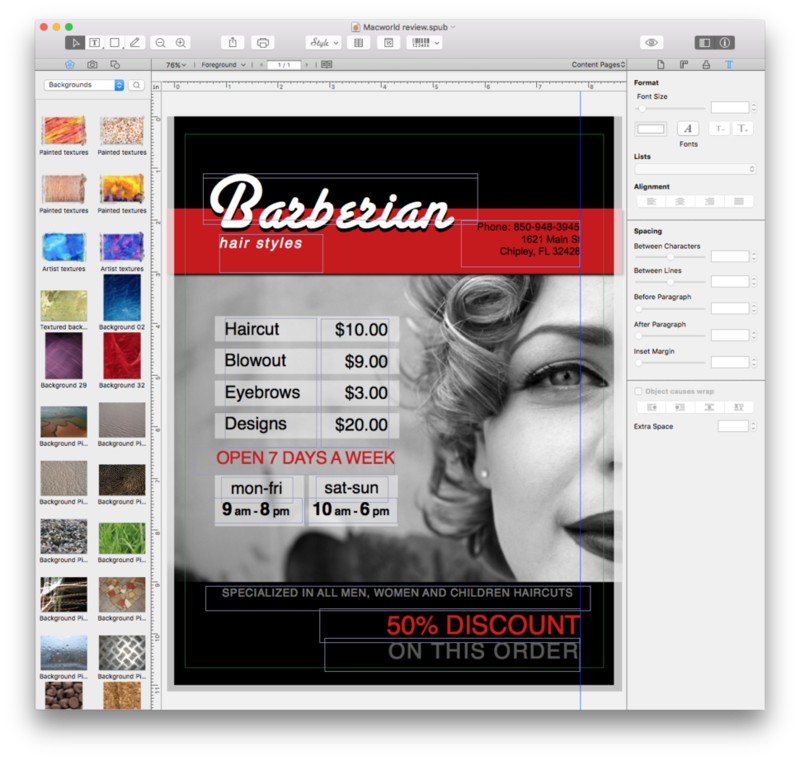 A quality, full-featured Mac page layout application for cheap? Swift Publisher 4 makes it possible. 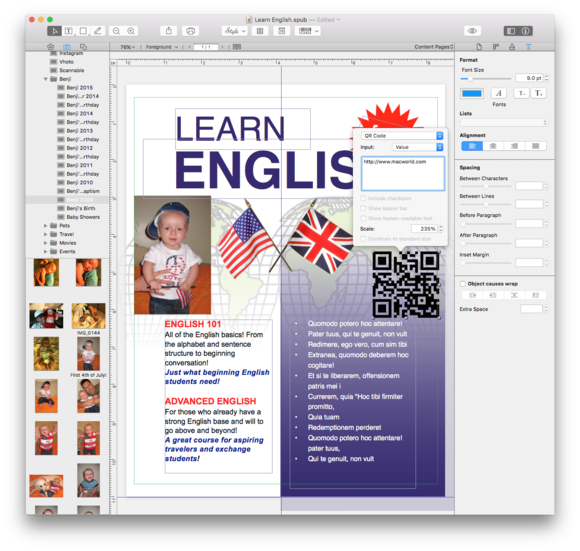 Swift Publisher 4 is an affordable page layout software for Mac that’s best described as a pared-down version of PageMaker’s successor, Adobe InDesign. Featuring nearly all of the same core functionality, it’s much easier to use thanks to exhaustive video tutorials and help menus, even for those with little or no previous design experience. At the heart of the software is a Template Gallery covering nearly 400 of the most common scenarios, including flyers, advertisements, catalogs, and restaurant menus. Fully-populated templates provide a quick way to get started, since text and graphic elements can be added, customized, or removed in a few clicks of the mouse. In keeping with the times, there’s even an “Electronic Media” section for designing Facebook and Twitter covers, or iOS device screens. Designers can also start completely from scratch, selecting from thousands of built-in, high-quality clip art elements (and another 40,000 available via in-app purchase), Photos/Aperture/iPhoto libraries, and smart shapes from the source panel at left. The Insert menu allows placing other media types into a document, including photos, text, tables, calendars, and more. Once placed, elements can be manipulated using the Layout tools at right, as well as a Toolbar across the top; the majority of the window is reserved for designing and managing single or multiple-page documents. It’s not a groundbreaking user interface, but one that will make iLife users feel immediately at home, which consolidates the comprehensive feature set while aiding in the design process. Barcodes have finally met their match, thanks to Swift Publisher 4’s built-in ability to generate QR, ISBN, UPC, and more. Version 4.0 brings barcodes into the mix in a big way, making it easy to insert QR, ISBN, and retail UPC codes into a document with custom values—something that requires additional software for many high-end design applications. The update also introduces dynamic text fields, the equivalent of Microsoft Word’s popular Mail Merge feature for quickly swapping out names, address information, and more in a snap. Swift Publisher includes built-in image editing capabilities, tapping into OS X’s Core Image filters to adjust color, exposure, gamma, and a wide range of other enhancements without round-tripping already placed files to other software. I was even able to import older vector-based Adobe Illustrator and EPS files, although they use a lower-resolution bitmap preview for on-screen display and printing. Given the budget price, it shouldn’t be surprising Swift Publisher lacks a few high-end features like true CMYK preview and robust type controls, but this won’t be an issue for the target audience. It’s an exceptional value for parents, home business, educators, and just about anyone else who needs to create paper-based products quickly and easily. 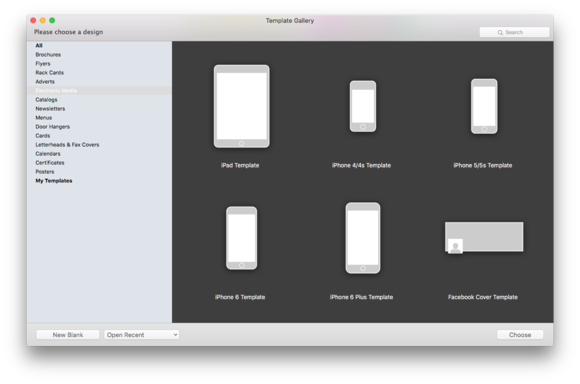 The included Template Gallery makes it easy to design for a wide variety of common document types, or even iOS devices, Facebook, and Twitter graphics. Swift Publisher 4 keeps the desktop publishing spirit alive with inexpensive Mac software for designing just about anything that can be printed on paper.